The best rowing machine is one that is durable, comfortable, convenient, and will suit your needs to a T. These things are definitely amazing workout tools because they do so much for you. The problem is that there are so many options out there that deciding which one is right for you can be a real issue. Here we have a comprehensive list of rowing machine reviews to give you a great perspective on which ones are the best choices to go with. We have rowers of different sizes, types, and of course different price points too. We are going to talk about anything and everything to do with rowing machines so you can spend your money effectively and get the model which suits you the most! Rowing machines come in many different shapes, types, and sizes, which can be a problem when it comes time to pick the right one for you. Here we have a comprehensive list of the top 15 rowing machines out there. We have rowing machine reviews on entry level models ($50 – $200), mid range rowers ($200 - $500), and high end rowing machines ($500 - $1,500+). Our goal is to provide everybody and anybody with a good selection of the best rowing machines with respect to budget restraints. When it comes to all three price ranges, we’ve taken the liberty of whittling down all 15 choices to a list of the top 5 rowing machines which encompass all three price ranges. We’ve got in-depth reviews on all 15 rowing machines above (4 entry level models, 6 mid range models, and 5 high end models), but for now, let’s quickly talk about the very best top 5 rowing machines your money can buy. This is our favorite and the best overall rowing machine that your money could buy. This is a high end model with a fairly big price tag, but the investment is well worth it. The reason we like the Concept2 Model D Indoor Rowing Machine with PM5 so much is because of various reasons, one of which is the flywheel and damper combo. Many air resistance rowing machines don’t let you adjust the resistance manually, but the damper on this model allows you to do so with ease. The Concept2 Model D Indoor Rowing Machine with PM5 is made out of high-quality materials which allow it to have a max user weight limit of 500 pounds, something that is indeed very impressive. This is a fairly large rowing machine, which makes it ideal for taller people, yet another bonus. However, the Concept2 Model D Indoor Rowing Machine with PM5 also has the ability to be folded in half, which makes it great for easy storage and for transportation too. Moreover, the performance monitor which this rowing machine comes with is simply amazing because it lets you track so many different aspects, plus it can do even more. Also, everything about this rower including the seats, handlebars, and footrests are extremely comfortable for you to use for a prolonged period of time. The Concept2 Model D Indoor Rowing Machine with PM5 is our favorite rowing machine out there! Our top 5 list does contain another high end rowing machine, mainly because they are simply amazing. High end rowing machines do tend to be stronger, more functional, and more comfortable than lower end models, all things which are more than true for the WaterRower Club Rowing Machine in Ash Wood with S4 Monitor. We absolutely love the fact that this particular rower is made out of solid wood. Sure, metal frames are sturdy and functional, but so are wood ones, if not more so, plus they look stunning too. There is also the fact that the wood build of the WaterRower Club Rowing Machine in Ash Wood allows it to reduce noise and vibration while in use. Of course, this is a water resistance rowing machine, as opposed to magnetic or air resistance. We do really like the water resistance aspect because it allows for a real rowing feel. Rowing happens in the water and the WaterRower Club Rowing Machine in Ash Wood helps to mimic that feel without question, making it great for professionals training for the upcoming season. The WaterRower Club Rowing Machine in Ash Wood also comes with a solid performance monitor that will let you track various fitness metrics and more. When it comes to comfort, there is nothing to worry about with the WaterRower Club Rowing Machine in Ash Wood because everything about it was designed with your body in mind. This model is a little more expensive than most others, but seeing how durable and high quality it is, the price is worth it no doubt. Our third best overall rowing machine would have to be this one. This is a mid range model, which means it is not one of the cheaper ones, but also not in the most expensive category. This is a perfect rower for anybody who is serious about rowing on a regular basis, but not necessarily looking to become the next rowing champion. One of the things that we love about the Sunny Health & Fitness SF-RW5515 Magnetic Rowing Machine is the magnetic resistance which it features. Many types of resistance can be very loud and create lots of vibration. This is not true for magnetic resistance, which is smooth, quiet, and best of all, can be easily adjusted. The Sunny Health & Fitness SF-RW5515 Magnetic Rowing Machine has 8 preset resistance levels, making it perfect for beginner and intermediate rowers. It does of course come with a great performance monitoring system so you can keep track of your progress. Moreover, the Sunny Health & Fitness SF-RW5515 Magnetic Rowing Machine comes with large anti-slip foot pedals, well-padded handlebars with an ergonomic design, and a very comfortable padded seat. This model is fairly large, but not so large that you will need a whole separate room for it, plus it also has transportation wheels which make your life a heck of a lot easier. When it comes to mid range rowing machines, this is the best one you could hope for. The Stamina ATS Air Rower 1399 comes in at the number 4 spot of all top 15 rowing machines out there, and it is with good reason. Stamina has many rowing machines in their selection, but none of them really measure up to this one. There are actually 3 Stamina Air Rower options in our mid-range rowing machine list above, with this one being the best. While it is not actually the most expensive out of all Stamina models, it is indeed the most money efficient. The Stamina ATS Air Rower 1399 is not too large, it folds in half for easy storage, it has reliable air resistance, everything about it is extremely comfortable, it has a great performance monitoring system, and much more. When compared to the more expensive Stamina 1405, the Stamina 1399 is a better value for money choice. For instance, the Stamina Air Rower 1405 is a little bigger and more durable, but the price difference does not speak to value as much as we would like it to. If you want a really good mid range rowing machine that won’t cost you an arm and a leg, but will still give you a whole lot of value, then the Stamina ATS Air Rower 1399 is definitely the way to go. The Stamina ATS Air Rower 1399 is strong, convenient, comfortable, and comes with absolutely everything you need for a challenging yet rewarding rowing experience. The number five spot in our list of the best rowing machines is going to be taken by this entry level model. The Stamina Body Trac Glider 1050 Rowing Machine is a great rowing machine no doubt, and while it may not cost very much, it has managed to not sacrifice any quality or function. Something that sets the Stamina Body Trac Glider 1050 apart from the rest is that it features hydraulic gas shock resistance, which is a good option to go with for beginner rowing machines. It can be easily adjusted to various resistance levels, it is quiet, durable, and provides you with a smooth rowing experience too. The Stamina Body Trac Glider 1050 is also a cool option to go with because the handlebars are like actual oars on a row boat, thus perfectly mimicking real life rowing, something which everybody can appreciate. Moreover, the Stamina Body Trac Glider 1050 has a sturdy steel construction that will keep it in one piece for a very long time to come. This model is ideal for entry level rowers, especially for having at home because it is fairly small, it is very lightweight, and it folds in half too. When it comes to transportation and storage, the Stamina Body Trac Glider 1050 is probably the most convenient of them all. 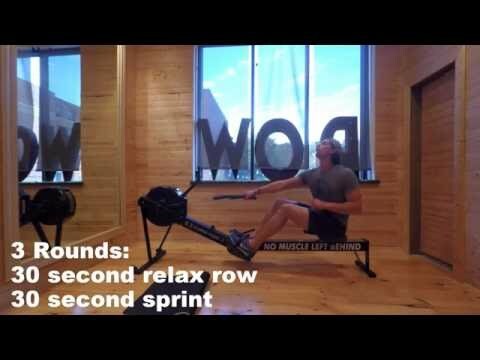 Finally, this rower is also very comfortable in every way imaginable, plus it also has a fairly comprehensive performance monitoring system too. As far as entry level rowing machines go, the Stamina Body Trac Glider 1050 is the best one out there. Rowing machines, as you can see, can end up costing you a pretty penny, so you definitely want to keep a few things in consideration before you make a final purchase. Here are some of the most important things you should look out for before buying any rowing machine for home use. Without a doubt, the most important aspect of a rowing machine is the resistance which it provides. Now, all types of resistance are great in their own way, but there are some differences. The main types of resistance that rowers will feature include air, water, hydraulic, and magnetic resistance. Air resistance is a good way to go because it is reliable and sometimes even manually adjustable, but it is loud and creates vibration. Water resistance is very smooth and quiet, plus it mimics real life rowing, but it usually cannot be manually adjusted. Magnetic resistance is also very smooth and quiet, plus it can be manually adjusted, which is also true for hydraulic resistance. The unfortunate thing here is that you may not know which type is right for you until you actually try it. Something very important that every indoor rowing machine needs without question is a good display. The performance monitoring system needs to be able to track basic fitness metrics when rowing. Things such as speed, calories burned, distance, stroke rate, and more should all be displayed. Moreover, it is convenient when the display can be moved around, plus it should be easy to maneuver, and fairly bright too. Yet another thing to look out for when buying a rowing machine is how comfortable it is. Simply put, the handlebars need to be ergonomically designed to fit your hands, plus they should have comfortable padding which prevents slipping. Moreover, the rower in question needs to have a comfortable seat that is shaped to accommodate the shape of a human backside, and it should be well-padded too. There is nothing worse than a painful backside when rowing. Also, the indoor rowing machine in question should have non-slip footrests with adjustable straps to prevent your feet from moving around. The size of the home rowing machine you are looking at is also fairly important. First of all, you are undoubtedly going to have special requirements, so you need to look for a model that will fit into your exercise room. If you have a smaller home, it is important that you look for a model with the ability to fold in half for easy storage. The size is also important because humans are all different sizes. Rowing machines are definitely not a one size fits all kind of thing. A person who is 6 foot 5 is obviously going to need a bigger rower than a 5-foot tall person. The final really important thing to keep an eye on is the frame. Now, the frame can be made of steel, aluminum, solid wood, or some other durable metal, but the material in question is not as important as what the material can do. Our point is that the rowing machine you get needs to be able to hold up a fair amount of weight with ease. For instance, a low end rower may be able to hold up to 250 pounds, a mid range option up to 500 pounds, and some of the strongest ones can support up to 1,000 pounds. You probably don’t need a machine that can hold 1,000 pounds, but it doesn’t hurt to know that it could if it came down to it. Rowing is an excellent form of exercise and that is true for various reasons. Let’s quickly talk about what some of the main benefits of rowing are and what they do for you. Without a doubt, one of the biggest benefits of the rowing machine is that it constitutes a full body workout. In other words, rowing is a compound exercise which works out many different muscles in your body at once. Some exercises will only engage one muscle or group of muscles, which is fine, but certainly not efficient. A rower exercises many different muscles at once. It takes your upper back, shoulders, arms and chest to pull on the handlebars. Your core and lower back get engaged (you should be flexing your abs when rowing), which means your core will get stronger. Also, you also utilize your legs when rowing, so those are getting a good challenge too. The point is that rowing is a great way to work out pretty much every muscle in your body at once, thus making it a very efficient form of exercise. Rowing is even great for helping to improve your grip strength too. Rowing is also great for another thing, which does have to do with your muscle strength, and that is your posture. Bad posture can result from weak back, core, and shoulder muscles, and ultimately bad posture can lead to severe, debilitating, and often permanent back problems if left unchecked. Well, rowing is a great way to strengthen those muscles which are needed to support good posture. Rowing helps to strengthen those core, back, and shoulder muscles. At the end of the day, you will look taller, be stronger, feel more confident, and get rid of all of that pain that comes with being slouched over all of the time. Another one of the main benefits of rowing on a regular basis is that it is amazing for weight loss. Rowing is a very energy intensive aerobic exercise, and that means burning a serious number of calories. In fact, one rowing session can help you burn anywhere from 300 to 700 calories when going at a moderate intensity, more if you are really pushing yourself. The point is that you can actually burn away a whole quarter of your daily calorie intake with this fun and rewarding type of exercise. There is also the fact that rowing will help to increase your metabolic rate. This means that you will burn more calories on average, even when you are done exercising, compared to if you were not rowing. The ultimate result here is that you will have a much easier time losing weight and keeping it off if you row on a regular basis. Another thing which rowing is great for is your aerobic health. Now there are actually two aspects to this, those being your heart health and lung function. Aerobic exercise causes your heart rate to dramatically increase, which is also true for your rate of respiration. As is the case with your muscles and strength training, aerobic exercises such as rowing will help to train your heart and lungs to be stronger and more efficient at their respective jobs. Rowing will help to make your heart stronger, prevent heart and arterial diseases, and will make it easier to pump oxygenated blood around your body. At the same time, rowing will help to increase your VO2 max, which is how much oxygen your lungs can absorb, process, and send throughout your body. The more you row, the more efficient your lungs will get at supplying your body with oxygen, thus preventing you from getting winded, increasing your endurance, and contributing to overall healthy lungs as well. High impact aerobic exercise will definitely do their job, but they can be dangerous and painful for people who are experiencing bone and joint problems. Low impact exercises, on the other hand, are perfect for people who may be suffering from bone and joint conditions. To be clear, low impact exercises are ones which do not involve both, or even one of your feet, leaving the ground and slamming back down, therefore creating impact that can be painful in the long run. Rowing never makes your feet leave the pedals and come back down with force, thus allowing you to get a good aerobic workout without putting your joints at risk. At the end of the day, rowing can help to seriously improve your overall endurance. Like we mentioned before, rowing will make your muscles stronger, it will make your heart and lungs more efficient, and it will help you lose weight too. All of these factors combined together definitely result in vastly i﻿﻿n﻿﻿﻿creased ﻿phy﻿﻿sical en﻿﻿durance. Plus there is also the fact that you will look much better than ever before and feel much happier too. Using a rowing machine is not all that hard, but there are a few tips you should follow if you hope to avoid any pain and undue joint stress. Rowing is one of those types of exercise that can result in pain if not done correctly, so you do want to pay attention here. First, let’s do a little step by step guide on proper rowing technique. 1. If you are a beginner, start out by setting the resistance to a low level. This is something you can increase as you get better and fitter. 2. Make sure your feet are on the footrests. Ensure that the straps are tight so that your feet don’t slide around or even fall out of the footrests completely. 3. Bring your knees up, slide to the front of the machine, and use an overhand grip to take the handlebars into your hands. 4. Slide back on the machine until your legs are almost straight, but keep your knees slightly bent (do not lock them). Lean back a little bit, hold your hands (and the handlebars) slightly below your chest with your elbows pointing down and at your sides. This is your starting position as well as the position you will assume after every full stroke. 5. Now it is time to start rowing. Extend your arms forward while at the same time moving your knees up (contracting your legs). Your upper body should follow soon after you have started this process. In other words, now you are moving towards the monitor (this is the first real step in the rowing procedure). Make sure to keep your back straight and do not bend it because that can cause pain. When you do this your upper body will go from being angled slightly backward to being angled slightly forward. 6. Remember to start by extending your arms and moving your upper body forward. Remember, proper rowing form is essential. The bending of your knees and sliding the seat towards the front of the machine should follow shortly after the arms and body start to move forward. 7. Now it is time to move back into the starting position. Start by pushing with your legs until they are about half way between straight and bent. Once this has been done, pull in your arms back to the starting position and move your upper body back until you are leaning backward slightly again, while at the same time completely extending your legs (without locking in your knees). There are also some common rowing mistakes which should be avoided at all costs. Most importantly, don’t rush, don’t leave your abs loose, follow the proper rowing procedure, and try not to overdo it! There are various types of rowing machine workouts that you can do, so let’s take a quick look at what some of them are. An important point to note here is that not all rowing workouts just involve rowing! This one is really simple and ideal for beginners because it can be altered to suit your needs. You can increase or decrease either the distance and/or the rest time. Row 250 meters in 1 minute. This is a little more of an intense rowing exercise, but it is definitely worth it, plus you can alter it if you must. Row 1,000 meters in 6 minutes or less. If you finish early KEEP GOING! This one is a little more intense and does not just involve the rowing machine. This is great cross training type of routine to engage in. Row until you have burned 30 calories. Repeat this process for 3 to 6 times (depending on your fitness level). Now, this is a pretty intense one so bear with us. This one is definitely meant for more seasoned rowers really looking for a challenge. You can choose to repeat this two or even three times if it gets too easy. 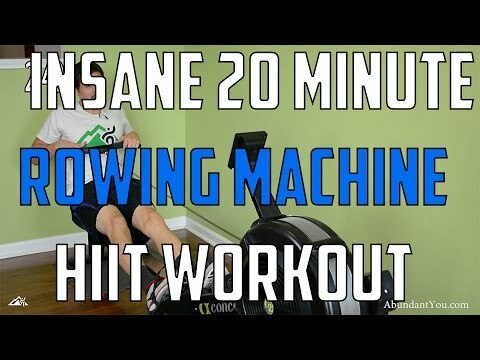 In case you would like to check out even more rowing machine workouts that you can engage in, check out some of the videos below. Rowing machines have a few moving parts and they will require some maintenance every now and again. So, follow these below tips in order to keep your home rowing machine in prime operational condition. An important part of rowing machine maintenance is to regularly check the nuts, screws, and bolts for tightness. Some rowers can produce a lot of vibration which will loosen connectors. Make sure to check all connectors and tighten them if necessary. You can try shaking the seat. If the seat is loose or wobbly, tighten the guide rails and the wheels. Also, make sure that the handle is securely connected to the chain or strap (if there is a chain or strap). You need to keep good care of the guide rail where the seat moves back and forth, which is also true for the seat rollers. You want a continuous, smooth, and bump free glide. So, take a cloth or rag along with some warm water and wipe down the rail and the guide wheels on the seat in order to remove dirt and stuck on grime. If you have a rowing machine with hydraulic resistance, make sure the cylinders are not leaking. If they are leaking, they will need to be replaced. If you have a rower with a chain, make sure to wipe it down with a damp cloth every now and again. Also, grease it up with some rowing machine lubricant or generic chain lubricant (bicycle lubricant is a decent option). If you have a rowing machine with water resistance, make sure to change the water regularly and add purification tablets. This is to prevent algae and other nasty stuff from growing in the water tank. Always wipe sweat and other contaminants off of the indoor rowing machine when you are done for the day. This is so none of it sticks on and creates a bumpy surface, not to mention that grime is never attractive. If you have an air flywheel, open it up once per month and wipe it down or vacuum it out. This is a fairly laborious process, but with these tips, you should not have a problem. The bottom line is that “the best rowing machine” can mean a lot of different things to different people. The best for one person may be a small hydraulic rowing machine while for another person it may be a large water flywheel model. Everybody is different and it is partially up to you to figure out exactly what you need. As long as you follow all of our tips and read our rowing machine reviews, you should have no problem finding the model that is best for you!